Inspired by the Chinese art of crosstalk, this work is also a clever conversation, but one that takes place entirely with body language. Watch in wonder as accounts of life, living and their bittersweet ironies unfold, set to classic crosstalk rhymes and rhythms. 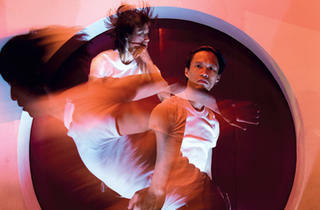 Co-choreographed by Taiwan’s Wu Yi-San and Singapore’s Kuik Swee Boon, and performed by dancers from Taiwan and Singapore. Part of Huayi 2014.